And he still gets to keep the badge and gun! CAIR-Florida has taken down from its website Nezar Hamze’s photo and bio, as he has left the Hamas-linked group and gone elsewhere. His new position, however, poses no less of a threat. Hamze, who is also a Deputy at the Broward County Sheriff’s Office (BSO), is now the Executive Director of the South Florida Muslim Federation (SFMF), an umbrella group for South Florida’s many radical Muslim organizations, which includes CAIR. Given the obvious conflict of interests, it is a wonder how Hamze has been allowed to keep his position within the Sheriff’s Department, while holding these terror-related side-jobs. No doubt, he has been and continues to be a danger to the community, which ironically he has sworn to protect. Nezar Jason Nazih Hamze, the Michigan-born son of Lebanese immigrants, spent over a decade of involvement with CAIR or the Council on American-Islamic Relations. He began as a member of the group’s Florida Executive Committee, in 2008, the same year that CAIR was named an “unindicted co-conspirator” by the US government for the Hamas-financing trial of the Holy Land Foundation for Relief and Development (HLF), where all of the defendants in the trial were found guilty of all charges brought against them. During Hamze’s tenure with CAIR, Hamze sought involvement with other terror-related groups, specifically Islamic Relief (IR) and the Islamic Circle of North America (ICNA). Israel has banned Islamic Relief, labeling it a Hamas front and arresting its Gaza Program Manager, Ayaz Ali, in 2006, for providing assistance to Hamas. At the end of 2014, Britain’s HSBC bank cut ties with Islamic Relief over concerns about “terrorist financing.” Reports show that Islamic Relief has sent millions of dollars to and received tens of thousands of dollars from groups related to al-Qaeda. ICNA is the US affiliate of Jamaat-e-Islami (JI), South Asia’s largest Islamist group. JI’s militant wing, Hizbul Mujahideen (HM), owned the Pakistani compound where Osama bin Laden was living and eventually killed in. ICNA, itself, has been linked to terrorist financing and has used the internet to promote terror groups Hezbollah, Hamas, al-Qaeda and the Taliban. Former ICNA Secretary General, Ashrafuzzaman Khan, was sentenced to death for his role in the murders of 18 people as a death squad leader during Bangladesh’s 1971 War of Independence. All of this was ignored, when Hamze was hired to be a Deputy Sheriff at BSO. Then-Broward Sheriff Scott Israel said he saw no issue with Hamze and even called him “friend.” However, Scott Israel is no longer Sheriff. Newly elected Governor of Florida, Ron DeSantis, made sure to remove him, amidst the scandal of Israel’s mishandling of the Marjory Stoneman Douglas High School shooting, which left 17 students and faculty dead. So why is Hamze still involved with law enforcement? Why was he not removed as well? No doubt, he remains deeply involved with promoting radical Islam, as his new job shows. On November 21, 2018, Hamze announced, on his Facebook page, that he was starting a new job as Executive Director of the South Florida Muslim Federation (SFMF). He also announced that he had left his job with CAIR. His new job, though, allows him to continue his involvement with CAIR – along with Islamic Relief and ICNA – as SFMF is an umbrella group for all these organizations and so many others. This includes a number of radical mosques with documented ties to terrorism. Samir Kakli is the President of the SFMF Executive Committee and a devotee to the bigoted BDS movement against Israel. In November 2016, Kakli referred to Siraj Wahhaj, the Imam of Brooklyn, New York’s At-Taqwa Mosque, as “an amazing person.” In 1995, Wahhaj was named by the US government as an “unindicted co-conspirator” for the federal trial dealing with the 1993 World Trade Center bombing. Wahhaj had been linked to the bomb-maker of the attack, Clement Rodney Hampton-El, and during the trial, he was a character witness for the spiritual leader of the attack, the “Blind Sheikh” Omar Abdel Rahman, whom Wahhaj has openly praised. While Nezar Hamze has left his position with CAIR, he remains associated with the group and every other radical Muslim organization he has come in contact with in South Florida, via his new position as SFMF Executive Director. At the same time, he has managed to keep his job as Deputy Sheriff, along with his badge and gun, something that should send chills down the spines of all Floridians and Americans and is a blatant dereliction of duty on the part of the BSO, as he exploits his status to gain the public’s trust. Hamze and the individuals and groups he is affiliated with, whose interests he both represents and promotes, institute a clear and present danger to society and are real threats to homeland security. It is time for the Broward Sheriff’s Office to exercise due diligence and wake up to this existential threat. Hamze’s presence within the ranks of one of the most prominent policing facilities in the nation needs to be reevaluated and investigated. For his colleagues to turn a blind eye to his activities, while permitting him to be embedded in law enforcement, subverts their mission and makes a mockery of their mandate. Good for him. Hes a nice young man and a good deputy. Hes active with his religion and beliefs just like anyone who supports their church or synagogue. Every religion could be traced back to something negative. You got nothing here. Holy Hypocrisy, Batman! Taqiyya and Kitman at play @ BSO & BCSB! When funds are tainted with violence. The Broward Education Foundation (BEF) has set up a fund to assist the survivors and the families of the victims of last month’s Stoneman Douglas High School shooting, which took the lives of 17 innocent students and faculty. The fund has accepted money from many sources, including a group, the South Florida Muslim Federation, that acts as an umbrella organization for a number of smaller groups, many of which have numerous links to terrorism and bigotry. 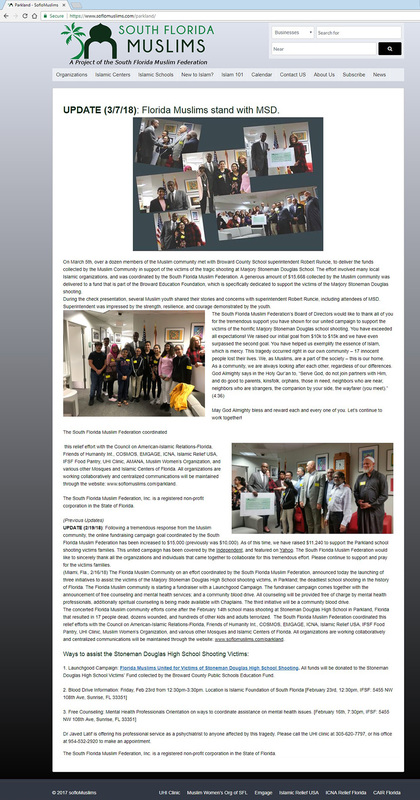 On March 5th, the Broward County Public Schools (BCPS) Superintendent Robert Runcie and BEF Executive Director Shea Ciriago held, up high, a check containing the South Florida Muslim Federation (SFMF) logo for $15,668. The money was raised via a page set up by SFMF on the crowdfunding site, LaunchGood. A dozen Muslim associates from the group came for the photo op and to present the check. A page on the SFMF website has been created to publicize the check presentation. On it are mentioned a number of SFMF groups that helped coordinate the raising of the funds. They include: the Council on American-Islamic Relations (CAIR), the Islamic Circle of North America (ICNA), the American Muslim Association of North America (AMANA), Islamic Relief (IR), and the Islamic Foundation of South Florida (IFSF). He told me he was an oil sheik. You need to be water boarded with pig bowels. He has American blood on his hands. I think Hamas hamzee wrote this himself! Nice young man? Gyf!